Don't let an unpredictable Internet connection keep you from where you're going. Sometimes you just can’t get an Internet connection. Maybe you’re unlucky enough to be on an airplane with no Wi-Fi or just driving through a section of the United States where connectivity is as infrequent as the next gas station. Sometimes a lack of connectivity isn’t a big deal, but on other occasions it can be a problem—especially if you need a map. Sure you can get offline maps on your phone, or go old school with a paper version, but viewing a searchable map on a large screen Windows 10 tablet or laptop is a much better way to go. 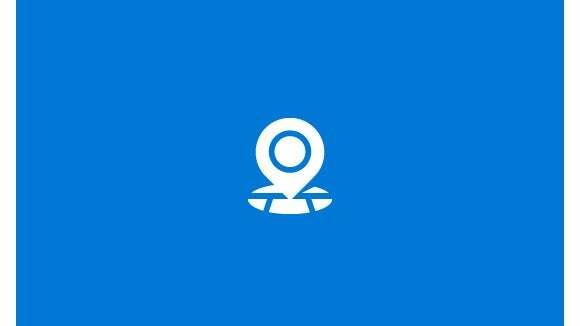 That’s where the built-in Maps app for Windows 10 comes in. Note: This tip shows examples for Windows 10 on PCs, but it works exactly the same way on Windows 10 Mobile. Open the Settings app and go to System > Offline maps. Before we download any maps, let’s make sure you’re saving them where you want. Look for the subheading Storage location (this option may not be available to all devices) and the drop down-menu under “Change where you store offline maps.” By default, it should store your maps in the “C” drive, but if you have a tablet with an SD card, you may prefer to save it on the removable media. Clicking on the drop-down menu will show all possible locations where your maps can be saved. Now scroll down to the Metered connections subheading. By default this feature is turned off and it’s best to keep it that way. 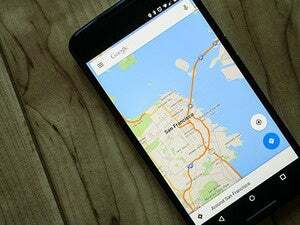 In the off position, offline maps will only download over Wi-Fi or unlimited cellular data. Typically, activating a setting called metered connections would tell your device to only download over Wi-Fi, but it seems to be the reverse here. Now we’re ready to download some maps. Keep in mind that you can only use the basic version of maps in offline mode. Advanced features such as Streetside (Microsoft’s version of Google’s Street View) are only available when you have an Internet connection. 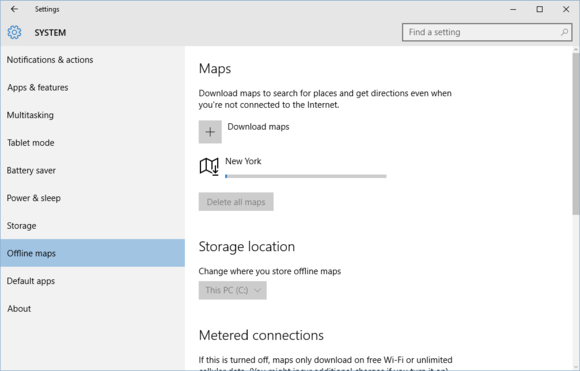 Click the plus symbol next to Download maps. 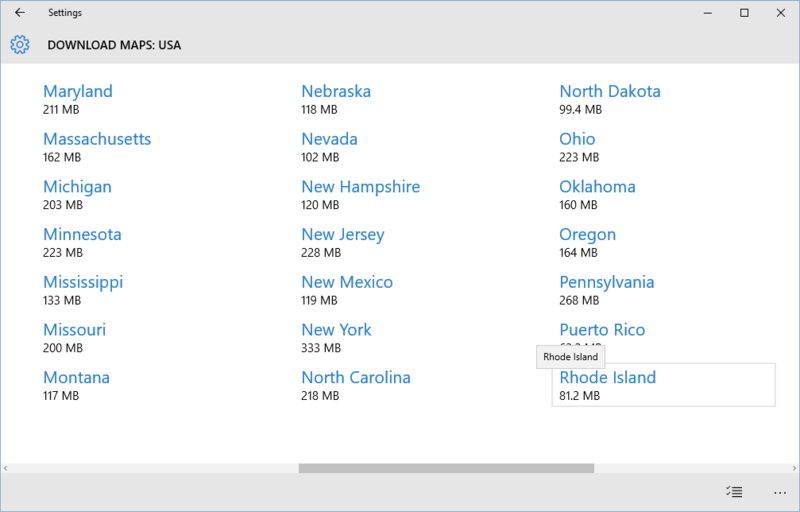 This opens a new screen listing six continents with available maps—sorry, folks, no road trips to Antarctica with Windows 10. 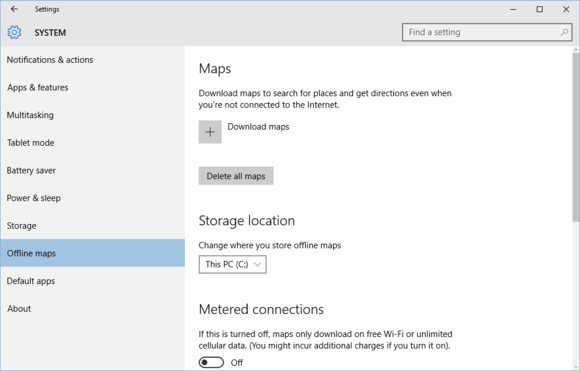 Choose your preferred location to download a map for offline use. Let’s say you’re flying to New York City for a conference and you want to look at a local map during the flight even if there’s no Wi-Fi. Select North and Central America > USA > New York. This downloads the state map, which includes data for the city. 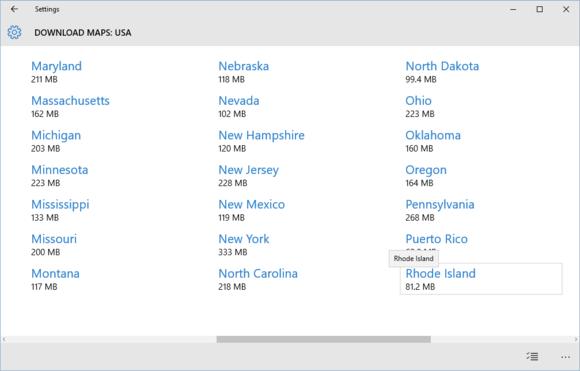 Note that if you want to download the entire USA map you can do that, but it will cost you about 4GB worth of disk space. A Windows 10 offline map download in action. As the map is downloading you’ll see its progress on the main screen of Settings > System > Offline maps. Once it’s done, all you have to do is fire up the Maps app when you’re offline to gain access to the cached data.